So I've had a nice little break from reality...but now it's time to get back to business!! 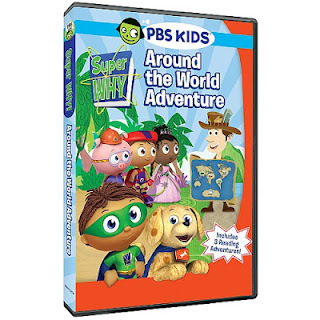 I loved that the stories on this Super WHY! DVD helped the boys learn about geography, letters, and vocabulary. I also liked that it encouraged the boys to investigate the alphabet, practice spelling, and using words! Another thing that I really liked is that since it's a PBS show...the previews before the movie were all of PBS shows, so I didn't have to worry about the boys seeing previews for something I wouldn't want them to watch! Reading is power and Super WHY! helps kids learn the fundamentals of reading through interactive storybook adventures! 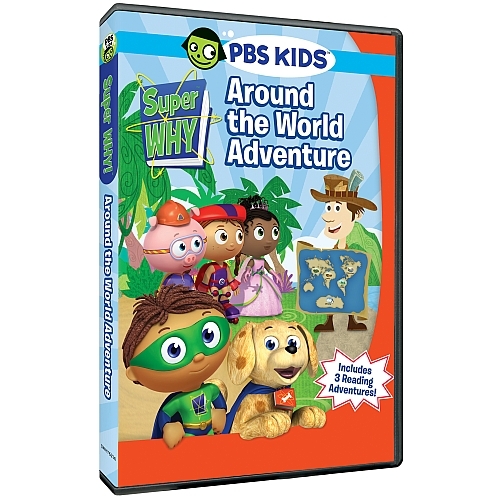 The episodes included on this DVD were Around the World Adventure, Maila and the Magic Map, and Jasper's Cowboy Wish. Jasper's Cowboy Wish - Howdy partner! Whyatt and his friends are playing cowboys, but Pig can't join in because he doesn't know what cowboys do. The super readers jump into the tale Jasper's Cowboy Wish and make the acquaintance of a cowpoke who's desperate to become a rompin' stompin' cowboy, if only he could get the hang of it! When Jasper must use his cowboy skills to save the day, will he be a hero...or will this be his last roundup? Here's a short clip of the DVD! Be sure to check it out!